The latest KaBOOM! 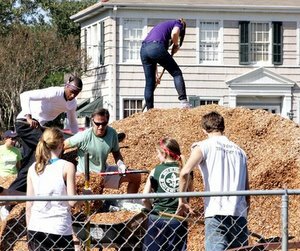 playground in Uptown New Orleans will be built by volunteers Saturday at Conrad Park on Hamilton Street, only two weeks after the same organization brought new equipment to the Claiborne Avenue campus of Lycée Français de la Nouvelle Orléans. 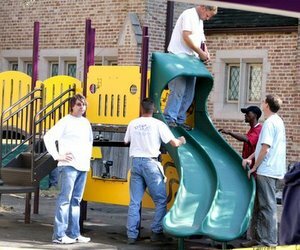 WHAT:	More than 200 volunteers will join together on Saturday, Nov. 19 to build a new playground at Hollygrove’s Conrad Playground in one day. The new playground’s design is based on drawings created by children who participated in a Design Day event in September. The playground build is made possible by the DJR Foundation, Trinity Christian Community, the Saints players from the 2011 NFL lockout, the New Orleans Recreation Development Commission, organizers from KaBOOM! and residents of the Hollygrove community. WHY:	Today’s kids spend less time playing outside than any previous generation in part because only 1-in-5 children live within walking distance of a park or playground. This Play Deficit is having profound consequences for kids physically as well as mentally and socially. Children desperately need a place to play every day in order to be active and healthy. KaBOOM! is a national non-profit organization dedicated to saving play. For 15 years, KaBOOM! has been fighting the Play Deficit and saving play by ensuring there is a great place to play within walking distance of every child. The new playground will provide hundreds of children in the New Orleans community with a safe place to play. Currently, the children living in the neighborhood only have old, out-dated equipment to play on at Conrad Playground, which will be replaced by the new playground. The project is one of more than 150 playground builds KaBOOM! will lead across the country in 2011 in an effort to provide a great place to play within walking distance of every child in America. Trinity Christian Community is a 44 year old, faith-based community development organization that develops leaders from all walks of life who have a common passion to see New Orleans most vulnerable neighborhoods become havens of hope for all residents. Mrs. Shirley K. Haspel and the late Dr. Robert B. Haspel established the DJR Foundation at the Greater New Orleans Foundation in May 1997. The DJR Foundation’s purpose is to partner with non-profit organizations to enhance the quality of life for children of all ages through educational programming focused on child development and teacher training. The children of Lycée Français de la Nouvelle Orléans, Louisiana’s French charter school, got a new playground on Saturday, November 5 thanks to a Let’s Play grant from the Dr. Pepper Snapple Group and KaBOOM!, part of a $15 million, three-year initiative to build or fix up 2,000 playgrounds across the nation by 2013. Over 100 volunteers, among them parents and friends from the LFNO community, the First Presbyterian Church and Tulane University students, including many from the Phi Mu and Alpha Phi Omega sororities, participated in the one-day construction “blitz” for the new playground, which features two slides, a rock climbing wall and music-making features for kids. Generous donations of plants from The Plant Gallery, mulch and garden borders from The Home Depot and picnic tables from Lowe’s further helped to transform LFNO’s campus into a safe, colorful and verdant new playspace for the kids. The build was conducted under the professional guidance of Metairie, LA.-based Dyna-Play, which also generously donated volunteer time, tools and a kids’ bobble rider as a permanent part of the playground. It was organized under the collaboration of LFNO teacher/parent Darleen Mipro and parent Jill Holland. In addition to the Let’s Play grant, friends of LFNO raised nearly $8,000 for the playground build and coffee was provided by Carla Jewell of PJ’s Coffee & Tea of Magazine Street in New Orleans and Ernesto Montano of Café Luna, also on Magazine Street. LFNO is a Type 2, French immersion Louisiana charter school following the French National Curriculum snd currently serving students in grades Pre-K3 through Kindergarten. LFNO will begin accepting applications for enrollment for grades Pre-K3 through First Grade on Deceember 1, 2011. More information about the school can be found on its website at www.lfno.org or by calling 504-861-1601. More photos of the Lycée Français build can be found at the school’s Facebook page. We are not seeking volunteers for this playground build. We have had great success seeking out neighborhood volunteers and have filled all volunteers slots. Thanks for that information, Bill. I’ve changed the headline to make that clear.